Viewing topic "Rack-es compatible midi controller?" Hi, i have a motif rack es and evolution mk-461c midi controller. Unfortunately, rack-es sounds stopped when i press the keys of evolution. As i see, this is a polyphony issue and/or communication problem between two devices. I have tried hard reset in evolution midi controller, but the result is same. Rack-es is ok, because I ve played with Korg ps60 via MIDI, that was fine. So, any suggestions? which midi controller should i use with my motif rack-es? Roland a-800 pro says: The A-800PRO offers MIDI Transmission using Roland’s proprietary FPT (Fast Processing Technology). Is this a different MIDI protocol or compatible for motif rack-es? What do you mean by “stopped”. Does that mean it once worked, but it doesn’t anymore? Does that mean it works for a while, then quits? Details would help. Are you connecting via 5-pin DIN? Controllers don’t affect polyphony - only the receiving device determines that. If the problem was related to polyphony, it would be there with the Korg also. I might be able to help once you reply to my questions. stopped means, sounds being cut off suddenly as if i send note off message. midi controller keep working but i hear no sound. but this situation lasts very short time. PM: for example, i play a pad sound, it is heard during 2-3 seconds, but it stops suddenly. then, i continue to play without any trouble. this weird circle keep going all the time. “When I hook my M-Audio Keystation controller up to my Roland sound module, the notes drop out randomly when I release the keys. What’s going on? Is my Keystation defective? The short of the story is no, the Keystation is likely not defective, it’s just sending messages that the Roland is confusing for something else, explained below in more detail. The solution may be to perform a hard reset of the Keystation. In MIDI, there are two ways a note can be told to stop playing: Sending an actual note off message for say, the C# you just pressed and released, and sending a C# with a velocity of zero. Most sound modules interpret the latter as a note off message and work fine. But many Roland modules see this as another keypress. So if you’ve simply pushed a C# and released it, the Roland interprets this as a note on (play the note) at whatever velocity you pressed it at, as well as to play ANOTHER note at velocity zero (silent) when you release it. The next note you press also sends two note on messages, and so on. So very quickly, all the notes the module can produce are still playing, to the Roland, they have never been told to stop playing, and you’re out of polyphony. The only thing it can do is start shutting off notes to make room for the new note to play. Motif rack-es works fine with Casio Privia PX-330. Korg PS60 works fine with Motif rack-es. Evolution MK-461C works fine with Mac and PC. but Motif rack-es doesn’t work with Evolution MK-461C. Evolution trigger Motif via MIDI, but sounds drop unexpectedly. I thought MIDI is a standart protocol, but as i see, some hardware cannot communicate properly each other. For Motifs, Note-off is a Note-on message with velocity = 0(zero). If that’s what the Evolution MK-461C sends, then that’s not the cause of the problem you’re experiencing. The MIDI spec has the ports running on 5 volts. Some manufacturers have designed things to run on 3.3 volts. That can cause insufficient loop current with certain gear, causing corrupted MIDI data. I don’t know if the Evolution MK-461C runs the lower voltage. Have you tried to control the Rack ES via USB? The Rack ES and Evolution MK-461C would have to be connected to your computer, and software which includes MIDI port routing would be needed (DAWs, editors, etc., will usually work). Of course, the correct USB MIDI driver for the Rack ES would have to be installed, and see page 18 of the Rack XS Owner’s Manual for proper Utility mode setting. Yes, correct USB MIDI driver is installed on my computer, i had connected my rack-es to computer via USB for sound edit purpose. No, never tried Evolution and Rack-es via USB. 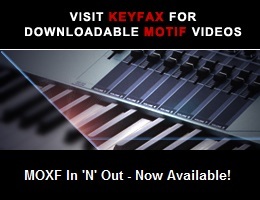 but i wanna use Motif rack-es on live performance with a midi controller keyboard. there will be no computer at stage. still, connecting rack-es and Evolution in computer environment would be useful to know further information. i ll try that. i checked the link, i see that i m not alone in such regard. MIDI can cause some problems. by the way, I cannot see any cooling stuff in Rack ES. no holes or air cooler space. I fear my Motif rack ES can face up to overheating issue, because it has hard case and foam in it. what do you think? is this enough for keep the hardware cool? [...]No, never tried Evolution and Rack-es via USB. Although they aren’t inexpensive, USB host adapters are available. Please let us know how that works (it should). I can’t say for certain that there will be a problem, but I agree that there should be some concern about overheating based on your description. If at all possible it would probably be a good idea to at least run a small fan, aimed at the rear panel. There are some relatively quiet ones on the market.